Add 1/2 cup of the chickpeas to the pitcher of a blender.Rinse remaining chickpeas. Spread a couple of paper towels on a rimmed baking sheet and spread chickpeas on top. Gently blot tops of chickpeas with additional paper towels until theyre relatively dry. Place the dried chickpeas in a bowl and drizzle with 2 teaspoons olive oil. Sprinkle with a couple of pinches of kosher salt and toss gently until coated with oil and salt. Discard paper towels and pour chickpeas onto baking sheet. Bake until golden and slightly crispy, 25-30 minutes.While the chickpeas are roasting, make and chill the soup. To the 1/2 cup chickpeas already in the pitcher of the blender, add the remaining ingredients (aside from toppings). Puree until smooth. Taste and add additional salt and pepper if desired. 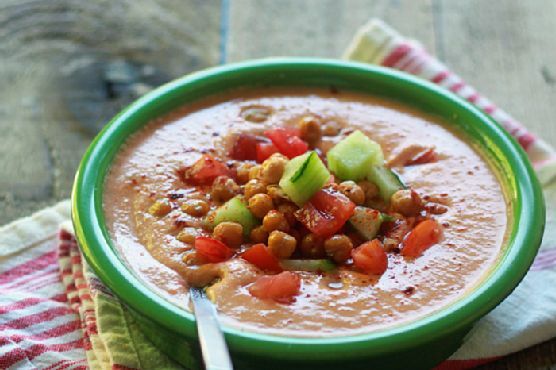 Place in an airtight container and refrigerate until very cold.Ladle into bowls and top with cucumber, tomato, roasted chickpeas, and a light sprinkle of smoked paprika.